Torque wrenches are useful for tightening bolts and nuts on products from the biking and automotive industry. Their significance is informed by the fact that some nuts and bolts have specific torque requirements so as to achieve accuracy and precision. The market is flooded with several torque wrenches, all of which vary in calibration, precision, and efficiency. There are similarly significant differences in features and specs necessitating a careful consideration of several important factors before making a purchase. Below, we present the criteria we used in selecting out top ten picks. A torque wrench is a device for controlling the amount of force used to tighten or loosen a bolt or a nut. It comes with a gauge to indicate the level of force used in the process so as to prevent a situation where the bolt is either over-tightened or over-loosened. They are mostly used in the automotive, biking, and telecommunications industries. They come in different sizes and capacities with the typical torque ranging between 10 ft. lbs and 250 ft. lbs. The Tekton 24335 comes in a relatively compact design, measuring just 18 3/8-inches in length and weighing approximately 2 pounds. Its lightweight design, therefore, makes it relatively suitable for accessing the tight places under the hoods of smaller cars. Nevertheless, finding an alternative torque wrench with specs similar to those of the Tekton 24335 is going to be a bit of a struggle. 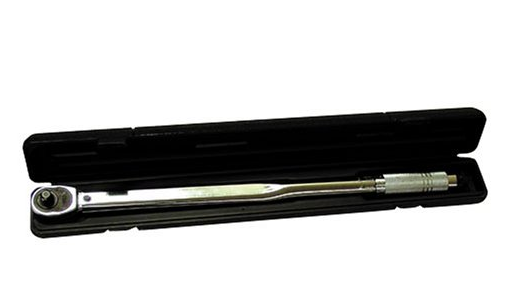 This torque wrench is also one of the most durable on the market today. To ensure its longevity, the manufacturers added a corrosion-resistant finish to the steel shaft. Additionally, hard-wearing chrome vanadium steel is used to make the head of the 24335. Your safety as a user is similarly taken into consideration. 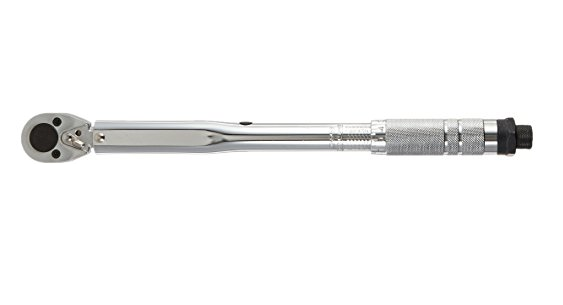 The torque wrench features a knurled grip on the handle whose aim is to make your hands fit as perfectly as possible on the hold, so there is no slippage. The possibility of the tool wobbling about is further eliminated by the red case that tightly keeps it intact. While a majority of cheap torque wrenches offer just a single scale, the more worthy ones, such as the 24335, make it possible to take measurements in two scales: the foot-pounds and Newton-meter. Range falls between 10 foot-pounds and 150 foot-pounds. The 24335 furthermore comes with a measurement scale that makes it relatively easy to monitor changes in foot-pounds. Considering that it is possible to use this torque wrench for a variety of purposes, it is imperative that it is as accurate as possible. 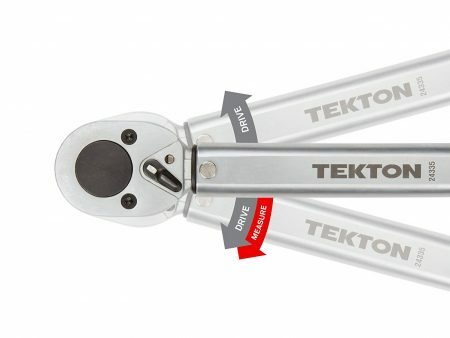 The Tekton torque wrench is accurate to between +/- 4 percent, which is quite impressive considering it is a budget pick. It is possible to reverse the rotation making it efficient to work on left-hand threads. It is constantly a recipient of high praise concerning performance. Its compact design and lightweight mean it is quite a portable tool. It is not too short so as to necessitate the use of extra strength. Its performance, however, takes a hit when you use it in an anti-clockwise rotation, as is the case with nearly all torque wrenches. The torque wrench gives you the ability to choose the torque settings you desire to which it responds with an audible "click" whenever you attain your preferred torque setting. It can drive and measure torque in both directions. You, therefore, have the liberty of moving either forwards or backward. Snap-on is one of those brands renowned all over the world for constructing high quality and durable products, and no product demonstrates this as clearly as the Snap-On Industrial Brand CDI Torque 2503MFRPH. Professionals throughout the world have critically-acclaimed the performance and versatility of the torque wrench. The brand takes all possible measures in ensuring that the CDI torque wrench and the rest of its high-end products are of similar superior standards. As is the case with the first two torque wrenches, the CDI torque wrench uses quite basic materials. It has an all-chrome vanadium steel casing. The handle feature a hard plastic finish to increase your handling of the torque wrench thereby preventing the tool from slipping from the hands while working. The CDI torque wrench weighs approximately 4 pounds and measures 21-inches in length. The first time you lift the torque wrench, you get the feeling that it is virtually indestructible. Other than the solid construction, it comes with a load of other useful features aimed at simplifying and easing your work. The torque wrench has two scales with foot-pound and Newton-meter calibrations. The range is quite wide, covering between 30 foot-pounds and 250 foot-pounds. With this tool, you have the freedom of setting the torque in either direction. The torque is furthermore more accurate when compared to a majority of torque wrenches with comparable features and specs. Its accuracies stand at +/- 3 percent and +/- 5 percent for clockwise and counter-clockwise rotations, respectively. Also, to prevent the accidental slippage of the settings, the tool comes with a lock-down ring. The inclusion of a quick-release socket button makes it exceedingly easy and smooth to retain and remove sockets. The Snap-on brand is synonymous with producing products that are both durable and superior in quality. While it is not as costly as other premium Snap-on products, its accuracy and durability are accredited by National Institute of Standards and Technology (N.I.S.T.). Its compact and lightweight design make the wrench ideal for accessing hard to reach spots. Setting up and using the tool is also a very straightforward procedure, taking just a few seconds of your time. The construction of the wrench leaves very little room to complain. Nevertheless, for the sake of improving user productivity and experience, it would have been prudent had the handle length been extended to at least two feet as this would accord the additional user leverage in directing the tool to the desired spot. Another downside of this impressive tool is the blurriness of the numbers, even though that is not a deal breaker. The CDI 1002MFRPH 3/8-inch is highly recommended for users looking to undertake light to medium-duty projects. The tool takes a lot of pride in its sturdy construction and outstanding longevity. 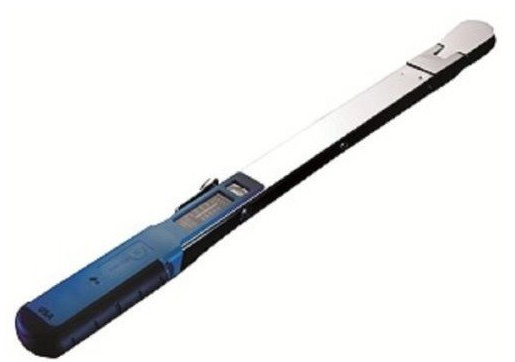 The torque wrench features a dual scale whose calibration is done in both directions and has an accuracy of +/- 4 percent in a counter-clockwise rotation and +/-3 percent in a clockwise rotation. The two sides of the torque wrench’s handle feature calibration done both in Newton-meters and foot-pounds for the purposes of measurement. The marking of the scales with the use of a laser makes it relatively easy to set up and read the torque. For the purposes of convenience, the 1002MFRPH features quick release buttons thereby allowing you to simply remove sockets or to fasten them. It is worth noting that the wrench has a rating of 10 foot-pounds to 100 foot-pounds. The ample knurling of the grip provides the user with better handling in a way that prevents the tool from slipping from the hands. The bottom grip has a rugged rubber finish that increases friction between the handle and the hand, guaranteeing a tight grip. Consequently, you are sure that with proper use the torque wrench can in no way cause you any harm. The ratchet head of the CDI torque wrench is capable of locking to a total of three positions whether forward, reverse, or center. The precision of the click notification coupled with the fact that it is adequately audible, relatively easy to adjust and feel, making the CDI torque wrench a true top-notch performer. Also, this torque wrench is one of the most accurate ones out there, a fact that is supported by the fact that it has received the certification of National Institute of Standards and Technology (N.I.S.T.). This is an utmost assurance to the user that using and cleaning the torque wrench is relatively straightforward, and that its durability and accuracy are certified. The all-stainless steel construction of this torque wrench considerably adds to its durability. With a weight of just a little over 2 pounds, the CDI torque wrench has a lightweight construction that makes it ample to operate and access hard-to-reach spots. Like most torque wrenches, the CDI has only one downside. Its durability and effectiveness are overshadowed its high price tag. If you have an eye for performance and quality, then the Precision Instruments C3FR250F is specifically for you. The torque wrench is made entirely of stainless steel giving you the much-sought-after longevity assurance. Additionally, the Precision torque wrench has a torque range of between 40 foot-pounds and 250 foot-pounds. This tool does not require recalibrating or the need to reset the torque settings after every subsequent use, thereby increasing your productivity. Furthermore, the design of the torque wrench makes it possible to lock-on your preferred setting. Upon reaching your preferred torque setting, you will hear a clearly audible click informing you to maintain your current torque. The Precision torque wrench has a weight of just 4 pounds and is 27-inches long, creating a perfect balance that gives you maximum leverage when operating the tool. The inclusion of a conversion chart on the handle makes it quite easy to convert foot-pounds to Newton-meters and vice-versa, eliminating the need for additional calculations. In spite of this, the Precision torque wrench lacks the calibration feature synonymous with nearly all of its competitors. It has considerably higher speeds because of the use of a spring-loaded system, which, when you combine with its length of 27-inches, gives you even more leverage. In no way does the length of this torque wrench interfere with its performance, and if anything, it works by increasing the use of use. A major difference between the Precision torque wrench and other torque wrenches is that it comes with an adjustable knob that does a wonderful job reducing the tension on the spring. Consequently, you will not experience any difficulties whatsoever when making adjustments. The Precision Instruments C3FR250F is maximized for light to heavy-duty projects and also happens to be very pocket-friendly. Setting it and using it does not require any experience with torque wrenches. However, you note that it lacks anti-clockwise direction and therefore may not particularly suit the needs of left-handed individuals and professionals. Other than this relatively minor setback, the C3FR250F packs power, convenience, precision, and performance all into one. With all its features and specs, using the torque wrench properly will ensure it always delivers, irrespective of the working conditions. Nothing screams professional quality and precision like a torque wrench made entirely out of hardened steel and given a chrome plate finishing. The use of hardened steel is aimed at making the torque wrench a durable tool capable of enduring even the harshest working conditions and the occasional but inadvertent drop. Fortunately, such is the Gorilla Automotive TW605. The chrome finish, on the other hand, makes it resistant to the effects of accidental slippage thereby ensuring it looks new and intact even after years of use. Other than having an effective 1/2-inch drive, this torque wrench also features a click adjustable mechanism to promptly alert whenever you reach your pre-set torque settings. This feature greatly increases precision and accuracy, especially when performing delicate operations. 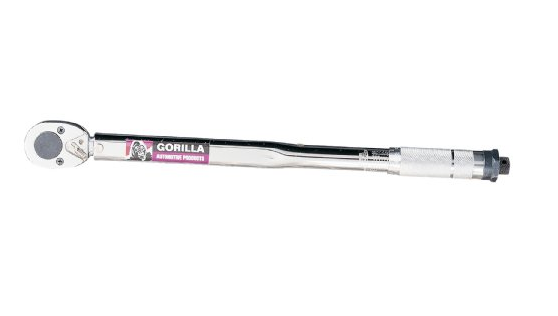 Nevertheless, the Gorilla torque wrench has the capacity to reach between 20 foot-pounds and 150 foot-pounds. These specs perfectly complement its length of 18 ¼-inches and weight of just 4 pounds and overshadow the fact that calibration is only done in the torque wrench has just a single scale with foot-pound calibration. The 1/2-inch drive is ideal for tightening large bolts that require more than 90 foot-pounds of torque. In case you are going to be undertaking delicate operations, we highly recommend switching to the 1/2 by 3/8-inch drive adapter instead. The adapter comes in handy when you need torque tension on the lower sides of the scale, anywhere within the proximity of 20 foot-pounds. Additionally, it comes with a selection of lug wrench adapters whose robust construction means they will effectively last for several decades. The adapters are constructed using hardened steel and are designed to have very thin walls making it possible to fit wheels that have narrow lug holes. In spite of the superior finish and performance, there is still room for improvement. The wrench comes with a poorly written user manual that can is very confusing, especially to English speakers. Calibration is done on one scale only: foot-pounds. Given the popularity of Newton-meter, this omission is hugely inconveniencing as you will have to obtain a conversion chart from the Internet. The delivery package contains the wrench itself, an extension bar measuring an ideal 5-inches, and an adapter with 1/2-inch by 3/8-inch measurements. The Craftsman 9-31425 perfectly combines a steel material construction and rugged strength in a way that yields a sufficient level of torque tension. With a blade measuring 1/2-inch, this tool is geared towards minimizing the possibility of you suffering an injury or harming yourself as it features a Lock-On and Lock-Off functionality in the twist ring. Your safety is further guaranteed with the inclusion of a comfortable handle that impressively prevents accidental slippage while using the torque wrench. The 9-31425 has an accuracy of between +/- 4 percent, which, depending on your usage, will either eliminate or greatly reduce the possibility of either blowing gaskets or damaging delicate parts of the torque wrench. While the calibration is yet to be certified by any major organization such as the National Institute of Standards and Technology (N.I.S.T), customer reviews for instance, indicate that it is quite accurate. Should you prefer a calibrated tool, it is still possible to have it calibrated. Another benefit to owning the 9-31425 torque wrench is that it comes with a dual range so that you can get readings both in foot-pounds and Newton-meter. The tool is even easier to use because, compared to some of its competitors, you will have no difficulties reading torque measurements since the scales are embedded within the body of the torque wrench. There will be time to waste setting it up for use as it arrives ready to use. It offers a torque range of between 20 foot-pounds and 150 foot-pounds. The inclusion of a click adjustable mechanism eliminates the need to physically keep track of the torque level as you work, which will tremendously increase your precision and therefore productivity. The torque wrench produces a clearly distinct sound that is quite hard to miss. 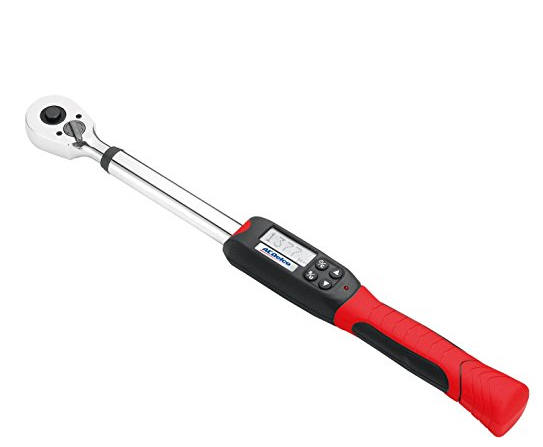 As a result, you will be using the Craftsman 9-31425 torque wrench to tighten loose bolts and nuts on whatever machine without breaking a sweat. While it is ideal for light-duty operations, its performance does not suffer any significant setback when you subject to greater levels of torque. Since alloyed steel is the primary material from which the torque wrench is made, it also enjoys the longevity and greater strength of steel. As a result, despite its placement as the seven best torque wrench, the Craftsman 9-31425 torque wrench is a strong candidate for the most long-lasting torque wrench. In an attempt to protect the torque wrench from the destructive consequences of rust, some parts of the torque wrench are made from plastics. A combination of steel and alloy is a fool proof way keeping away rust while significantly increasing the shelf-life of the Craftsman 9-31425 torque wrench. The Neiko 03713A is a very user-friendly tool. The construction of the Neiko torque wrench is done using chrome vanadium steel which substantially increases its durability and efficiency. Being resistant to corrosion and rust means it will retain its shiny and new appearance for the foreseeable future. The torque wrench comes with a click notification mechanism to, which, other than eliminating guesswork, increases your precision and efficiency. The Neiko provides between 10 and 80 foot-pounds of torque and a drive measuring 3/8-inches. The construction of the tool is quite simple to make it easy for you to effortless twist the handle. The laser markings on the sides of the Neiko are clearly visible to increase your precision when setting the torque. The torque wrench produces a distinctly audible notification sound alerting you whenever you reach your preferred torque level. As a result, apart from guaranteeing that there will be virtually no cases of over-tightening, the click notification mechanism increases accuracy while simultaneously reducing the possibility of damaging your nuts. The use of chrome vanadium steel material for construction does not affect the flexibility of the Neiko torque wrench in any way as it retains its top-notch performance even when subjected to the toughest of operations. Its robust alloy technology guides it against the damaging effects of excessive force. Upon receiving the Neiko torque wrench, you can delve into work literally the next second since it is already calibrated at within an accuracy of +/- 4 percent. Measuring a total of 14-inches in length, the torque wrench has reverse capability and Lock-on/lock-off feature which you can adjust in to suit your requirements. 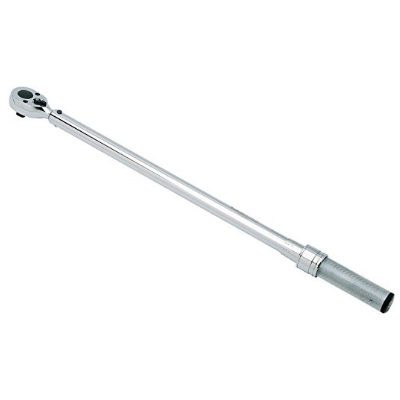 The torque wrench has a narrow neck design to allow better access to hidden spaces. Keeping the Neiko torque wrench safe and secure is easy with the ABS case with adequate room to store the user manual. The case is solidly constructed and is not very big so as to cause any damage or jarring to the tool. For professional contractors and DIYers with a fixed budget but still looking for a versatile torque wrench that compromises on performance, look no further than the Pittsburgh torque wrench. Made entirely out of stainless steel, the tool is capable of achieving between 20 foot-pounds and 150 foot-pounds of torque. 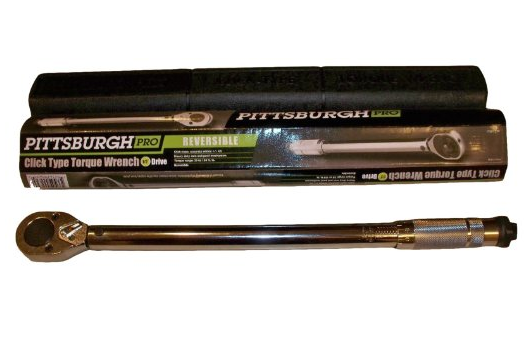 The Pittsburgh Pro 239 torque wrench is incredibly easy to use, even for first-timers. It has a provision for setting the desired torque, and when it reaches those settings, it notifies you through a "click" sound. The Pittsburgh has an ergonomic design with the entire length coming in at just 18-inches, which is appropriate for making you comfortable and giving you more maneuverability during your applications. The Pittsburgh comes with a nicely cushioned and durable polycarbonate case for storing the torque wrench and leaves almost no extra space for wiggling. Within its price range, it can be pointed out that the Pittsburgh torque wrench has the necessary features and specs to get the job done, even though it would be fair to compare its performance with those torque wrenches high on this list. 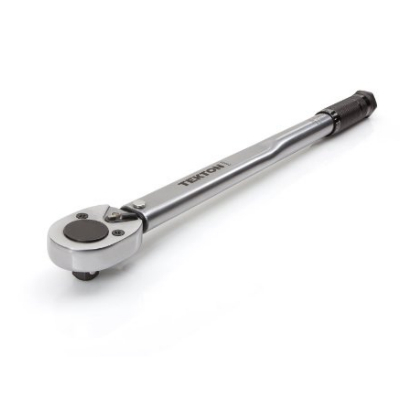 With proper use, however, it would be possible to considerably extend the durability of the Pittsburgh torque wrench and in the process get your money's worth. Nevertheless, it offers above average performance, as evidenced by the fact that more than 190 users on Amazon.com have given it positive reviews. Currently, it has a rating of 4.2 out of 5 stars. The Pittsburgh comes with a drive measuring 1/2-inch which is subsequently accurate to within +/- 4 percent. To make the tool even more versatile, it is relatively easy to reverse the drive even though as is the case with most torque wrenches, precision suffers a bit when the rotation is reversed. The Pittsburgh is also one of the lightest torque wrenches, weighing just 3.15 pounds to ensure it does not cause significant fatigue when being used. It incorporates a heavy-duty cam and pawl instrument that greatly increases the reliability and functionality of this tool. The sturdy construction of the tool makes it capable of enduring all amounts of force. Furthermore, the perfect construction of the Pittsburgh Pro 239 ensures there is a perfect alignment between the laser markings on the sides of the tool and the corresponding calibrations. Contrary to widespread reports on the Internet indicating that the Mountain 16250 torque wrench has a total length of 10 inches, it actually measures 25 inches. The weight stands approximately 6 pounds, making it one heavy torque wrench. The length of the Mountain 16250 makes the application of leverage quite easy, even though it may be a little cumbersome to use it accessing hard-to-reach spaces. Consequently, it lacks the maneuverability and portability of much smaller but equally powerful torque wrenches. The solid and sturdy construction of the Mountain 16250 torque wrench features a chromium alloy finish to ensure its durability. 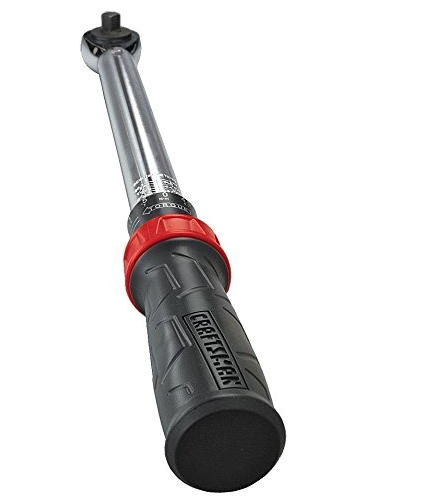 Furthermore, as is the situation with most cheap torque wrenches, the grip is made out of knurled steel to make it fit perfectly into the hands and to give you additional controllability and stability. Unlike more powerful model of torque wrenches, the settings of the Mountain 16250 comes in just a single range of between 25 foot-pound and 250 foot-pounds. The marking of the handle is done by the handle. In spite of it lacking the clarity of top-shelf torque wrenches in the market, the 16250 is quite easy to use. There is furthermore an easy availability of conversion charts should you find yourself in need of one. On a negative note, though, the case that comes with this torque wrench that has a reputation for being very fragile. The Mountain 1625 has quite a wide range for a budget torque wrench. It has a range of between 25 foot-pounds and 250 foot-pounds, which is more than adequate for your needs. The performance of the torque wrench is quite exceptional especially with regards to heavy-duty projects requiring considerable amounts of torque. However, using lower settings, such as 80 foot-pounds and below, considerably reduces the accuracy of the Mountain 1625. It is not only affordably priced, but it also offers some features that are conspicuously lacking even torque wrenches with top-notch performance. 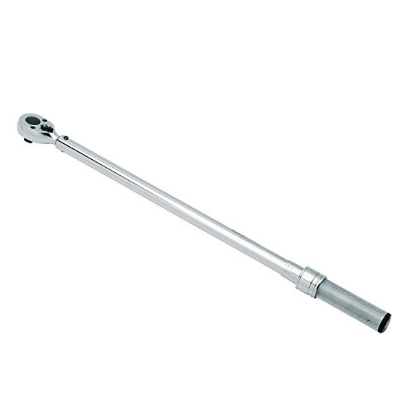 The extra-long handle, for instance, makes controlling and operating the torque wrench quite effortless and smooth. The sheer length of the torque wrench makes it possible to operate the tool with relatively short swing strokes. It features a durable chrome finish that effectively makes it ideal for industrial applications and the ability to withstand even the harshest working conditions. Nevertheless, the model does not come with a quick-release button to allow one to conveniently change sockets. Consequently, changing sockets is likely to be a labour-intensive and time-consuming procedure. There are similarly considerable issues with the durability of the Mountain 1625. 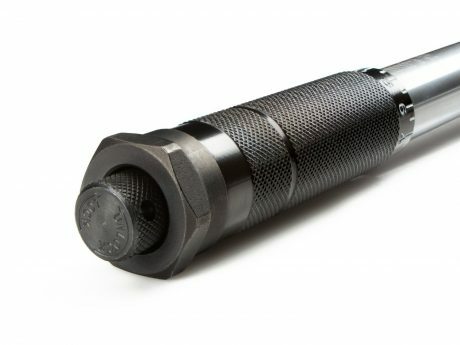 While a section of previous and current owners of this torque wrench indicate that it is not as durable as the manufacturers claim, others, nearly half, have contradictory views. Priced at just $63, the Mountain torque wrench is one of the cheapest torque wrenches in the market. It offsets its length and heaviness by providing better performance when working with large machinery. While it is definitely not a top performer, it is quite ideal for heavy-duty operations. The ACDelco ARM 1-4 features a durable all-chrome vanadium alloy construction in addition to other plastics and rubbers that protect the tool from the destructive consequences of oils and other fluids. It has a total weight of just 4 pounds and measures approximately 17 5/16-inches. The tool features a clear and easy-to-read readout which greatly eliminates the need to struggle to see the readings. Fastening and loosening things on the ACDelco torque wrench is a relatively straightforward thing as it has the capability of turning in both clockwise and anti-clockwise directions. There are an LCD screen and several other buttons that allow you to choose the foot-pound or newton-meter setting according to your preference. Once done, the torque wrench gives an audible notification buzzing whenever you reach your pre-set target for torque. Concerning performance, the ACDelco torque wrench beats quite a number of other similarly priced torque wrenches. The tool, for instance, has an impressive range starting from 4 foot-pounds to 99 foot-pounds. It is also quite an accurate torque wrench, with its tolerance ranging between +/- 2 percent for clockwise rotations and between +/- 3 percent for anti-clockwise rotations. Unlike the first three torque wrenches, the ACDelco torque wrench comes with two additional scales. Apart from the usual foot-pound and Newton-meter, it also has inch-pounds and kg-cm (kilogram per centimeter). While the latter two have increments of one unit each, the former two have increments of 0.1 units. Setting the peak and trace modes with the ACDelco torque wrench is also relatively stress-free. The tool features a clear and easy-to-read readout which greatly eliminates the need to struggle to see the readings. What the ACDelco lacks in range it more than makes up for in portability and accuracy. Since it has a short design, you are less likely to encounter any difficulties reaches tight spots. A quick check on Amazon.com reveals that the past and present owners have rated the ACDelco highly when it comes to quality and precision. Lastly, this torque wrench comes with a 12-month limited warranty from the date of purchase and a robust case. Since the case does not come with any batteries, you will need to purchase 4 AAA batteries separately. It is worth noting, however, that precision suffers a bit at the lowest end of the scale. Shows torque measurements on four scales: ft-lb, in-lb, Kg-cm, and N-m. The following criteria for evaluation were used to pick the options included in our list above. Also, these criteria is what you should have in mind when looking for a new torque wrench. The performance of a torque wrench rests squarely on the range of torque it offers. Your evaluation should consider the upper and lower limits of the torque wrench. Of similar significance is the unit in which the measurement is displayed, whether it is in Newton-meters, foot-pounds, kilogram per centimeters, or inch-pounds. A flexible and compatible torque wrench should accommodate most of these units. Wrench manufacturers ensure user-friendliness and comfortability by using superior components. Torque wrenches are made from durable materials such as metal and steel that are significantly more durable than those made entirely from plastic, for instance. Calibration is another factor to look out for, and whether its precision and durability have passed quality tests and received certification. Whenever possible, always endeavor to pick out the torque wrench loaded with additional beneficial features and accessories. Even though some torque wrenches do not come with a case, most of them come with carrying cases with adequate room to prevent the tool from getting jarred or damaged. Other features that have a significant bearing on the usability of a torque wrench are the size of the drive, length, and the extent to which it is accurate, among several other factors. These factors greatly determine how competitive or professional a torque wrench is when compared to other torque wrenches. Q: Which torque wrench is most appropriate for me? A: There a variety of factors to consider in deciding which torque wrench is suitable to your needs. The most common type of torque wrench is the click wrench. Because of its click notification mechanism, it will inform you when it reaches the torque level you pre-set. The initial click, which is quite audible on most torque wrenches, is an indication of optimum tightening. Take into consideration these factors before making a final decision. Q: What do I do to extend the shelf-life of my torque wrench? A: Taking proper care of your torque wrench can make it last a lifetime. First off, you will have to heed all the manufacturers’ instruction pertaining to use. Ensure the tool has proper calibration and that the values you set are within the scale, not higher and definitely not lower. Also, a torque wrench should be cleaned before storing it in its case. And obviously, never disassemble the tool with any intention of repairing or re-calibrating yourself. In choosing the best torque wrenches, we took several factors into consideration, including performance, durability, affordability, and convenience. The Tekton 24335 torque wrench comes at the very top owing to its performance, reliability, precision, and affordability. It is very accurate when it comes to tightening nuts and bolts. It goes without saying, however, that safety should be your priority.